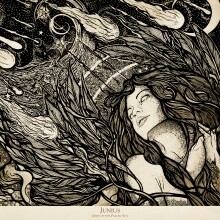 Junius has announced they will be releasing a new EP Days Of The Fallen Sun on February 18th via Prosthetic Records. The release of the EP will tie in with the group’s upcoming European tour with Long Distance Calling and Wolves Like Us. New music has not surfaced just yet, but a new song is expected to be released tomorrow and I will update this post with it when this occurs. Junius has also confirmed a new headlining tour date in the U.S., which will be supported by A Storm of Light. Check out the full list of dates and details about the EP below. Edit: Pitchfork is now streaming the track “Forgiving the Cleansing Meteor” which you can listen to here. In conjunction with their upcoming European tour with Long Distance Calling and label mates Wolves Like Us, the Boston post-rock quartet JUNIUS will release a new EP, “Days Of The Fallen Sun,” via Prosthetic Records on February 18. 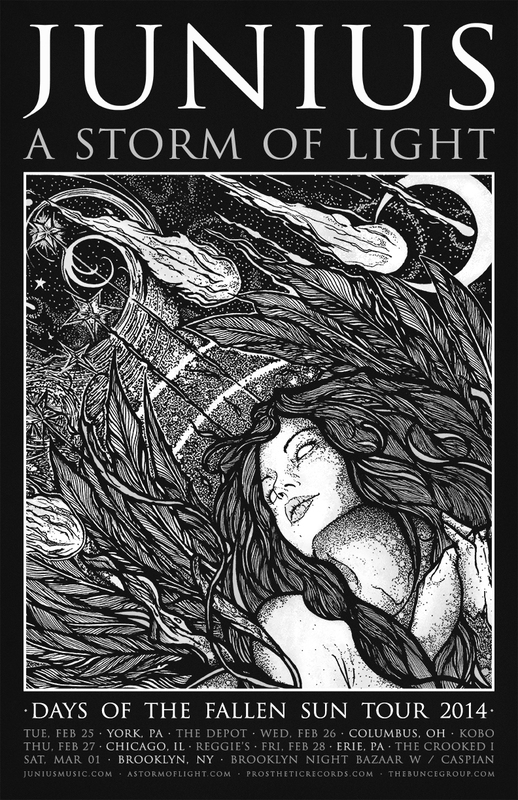 Along with cover artwork completed by Adrian Brouchy of Coven Illustration (as seen above), “Days Of The Fallen Sun” — which the band describes as a prequel to their 2009 full-length “The Martyrdom of a Catastrophist” — features four breathtaking full-length tracks with captivating interludes woven between. The EP was co-produced by the band and Will Benoit, with whom the band also collaborated on their acclaimed Prosthetic debut “Reports From The Threshold Of Death” (which Decibel named one of 2011’s Top 10 albums), using solar energy at The Radar Studio in Clinton, Conn. A new song will premiere on Wednesday; stay tuned for details. After returning from Europe, JUNIUS will perform a handful of headlining tour dates with support from A Storm of Light, followed by a performance in Brooklyn with recent tour mates Caspian. Full dates can be found below.